The first international break of the season has arrived. Except for the few who have made the call up to their respective nations, Frank Lampard’s Derby County players will enjoy some much-needed rest after participating in what had been Derby’s best start to a season for some time. The successful season start has been an unconventional one. However, despite earning an impressive 12 points in six matches and proceeding into the third round of the Football League Cup, there is still a feeling surrounding Pride Park that the Rams have a lot more to give for the remainder of the season. Two of their four wins were earned through a very late winner. The other victories came through back to back 2-0 wins at home. The rather back-handed compliment that Derby could play considerably better should take nothing away from the impressive start Lampard has made. Everyone who has watched Derby this season can see what Lampard is trying to implement into his side: controlled possession that is built from the back. Progressive football. 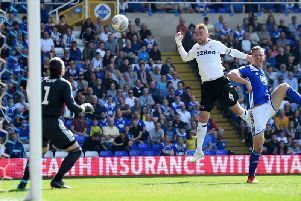 Despite a blip at home to the current league toppers Leeds United, Derby have looked decent defensively even without the commanding presence of Curtis Davies. We saw in their 4-0 cup victory over Hull City the damage that this style of football can inflict on teams. The win was Derby’s most outstanding performance this season by some way. They have yet to impose a similar amount of impact in the Championship. However, no one expected Derby to adjust to this new philosophy from the get go. Lampard is a new manager with new ideas and new tactics that will undoubtably change as the season progresses. The slick and intricate style of football he was involved in with Chelsea as a player has yet to be seen in full swing at Pride Park. At times, Derby have looked nervous on the ball and have made mistakes which have cost them after losing the ball deep in their own half. Many also feel their football in the midfield and final third still has a long way to come. Confidence to play Lampard’s favoured way will take some getting used to. Youth has been installed throughout the side which, for all its benefits, does unveil some troubles. These young players will take time to adjust to playing regularly; they will need guidance (as the season goes on) if they are to be successful in the style Lampard wishes them to play. Many of the goals Derby have conceded this season have been self-inflicted. As confidence and ability in the side grows and shows, these mistakes should begin to diminish. Derby and Lampard, though, will be satisfied that they continue to win games despite not reaching their absolute best. It has been the formula of many successful Championship sides in the past. Derby supporters can be sure of a bright future and an exciting season if and when Derby continue to improve as a squad.